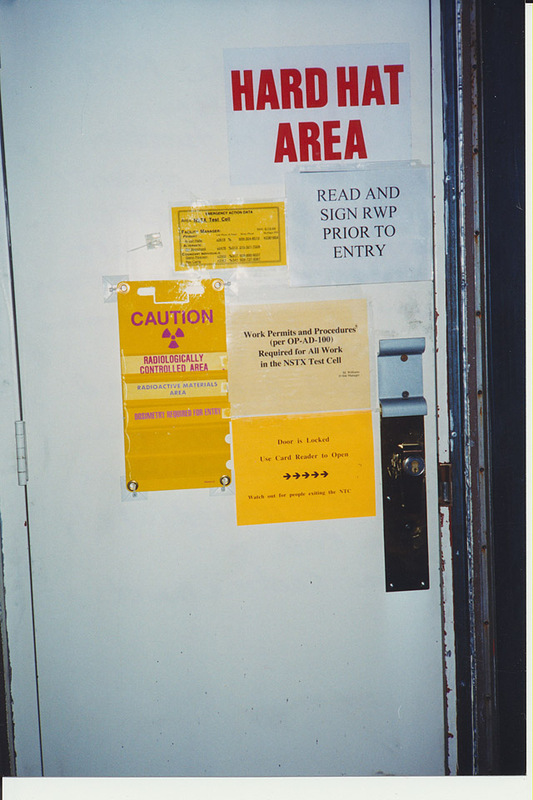 The door into the NSTX experimental area (Test Cell). 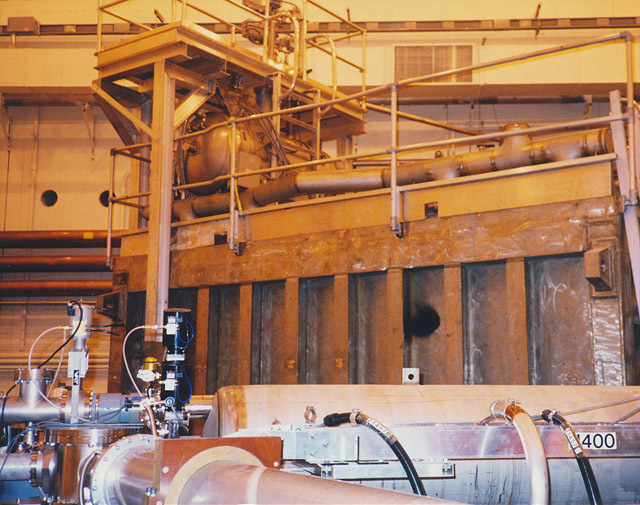 The fusion reaction presents a source of energetic neutrons and areas are secured during operations to protect personnel from these neutrons and associated gamma and x-ray radiation. 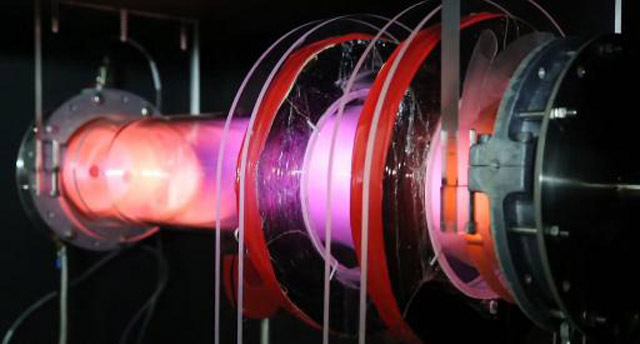 The generation of neutrons terminates immediately at the end of plasma confinement. 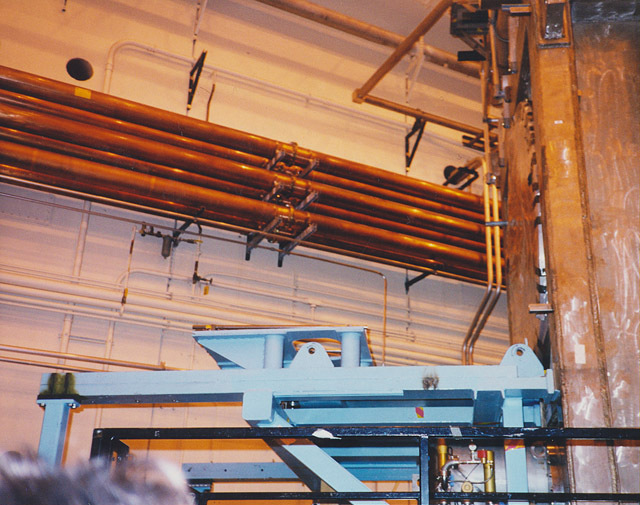 Coaxial Waveguides used to deliver the microwave power to the radio frequency antennae mounted in NSTX. 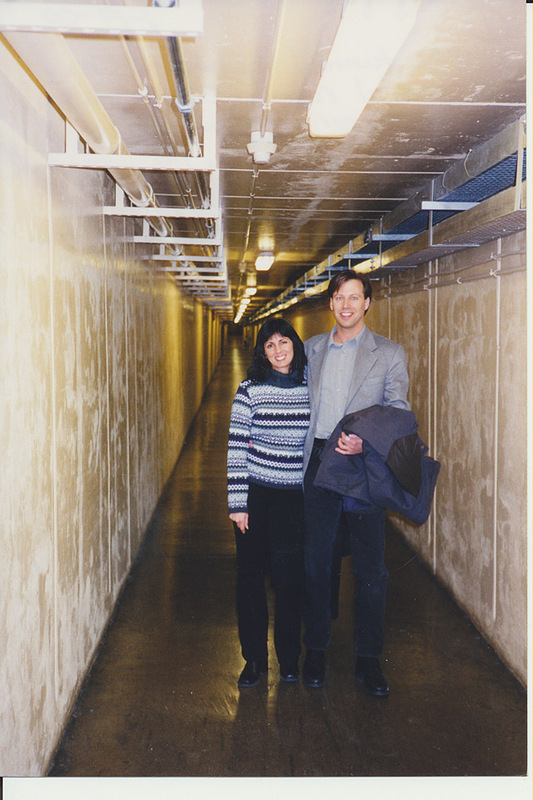 These antennae are capable of coupling 6 Mega-Watts of power to an NSTX plasma. The coaxial waveguides (mounted on wall) are run from C- Site where the RF power supplies are located. 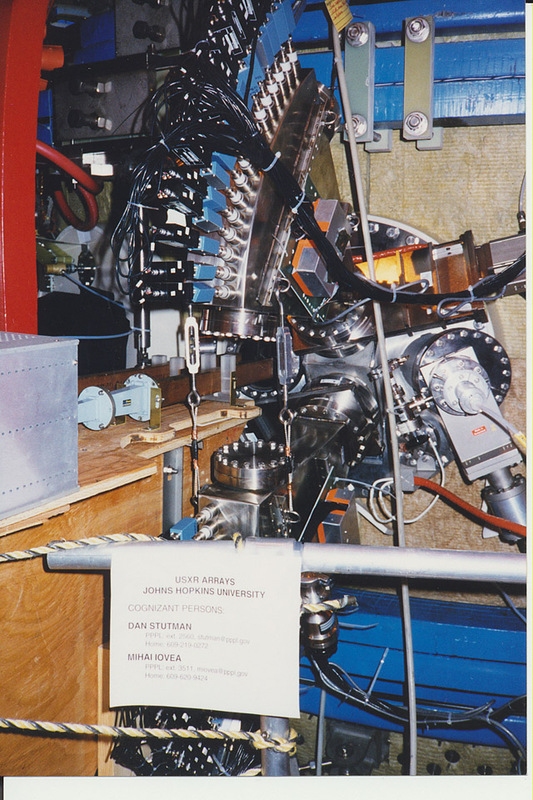 The beamline (still being commissioned) used by the three particle accelerators used to heat and fuel the plasma with up to 8 Mega-Watts of accelerated ions of deuterium, an isotope of hydrogen. 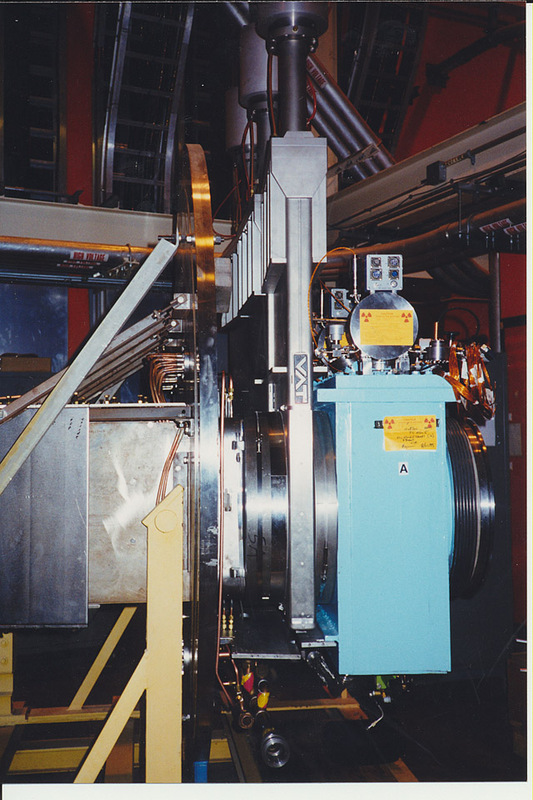 The beamline contains a neutralizer section to neutralize the beam through charge exchange so that it will pass through the machine magnetic fields. 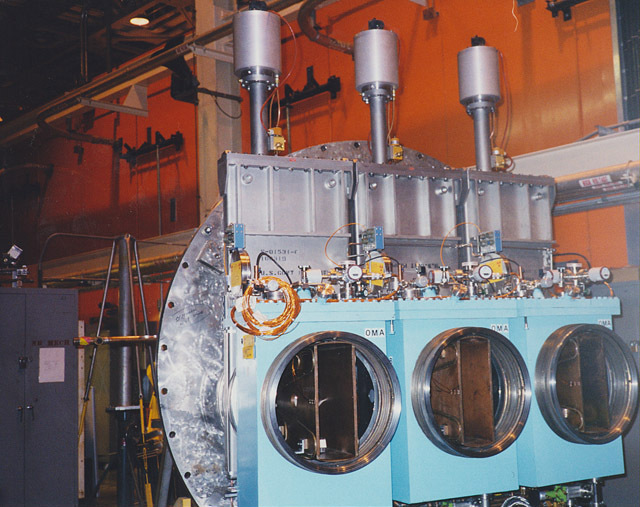 It also contains a sweep magnet and ion dump to absorb the non-neutralized beam particles, along with cryogenic panels (liquid helium) to pump any residual gas. 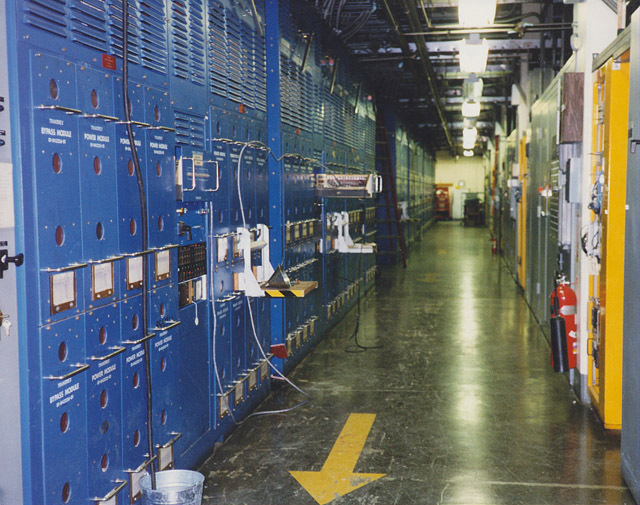 The power supplies for the particle accelerators enclosed in canisters (HVE' s) filled with sulfur hexafluoride, an insulating gas, to allow these supplies to "float" at the accelerating voltage of 120 Kilo-Volts. Hard to get the scale- these are about 10 ft high and 30 inches in diameter. One of the High Voltage Enclosures (HVE' s). The 90" flange to be mounted on the back of the beamline. 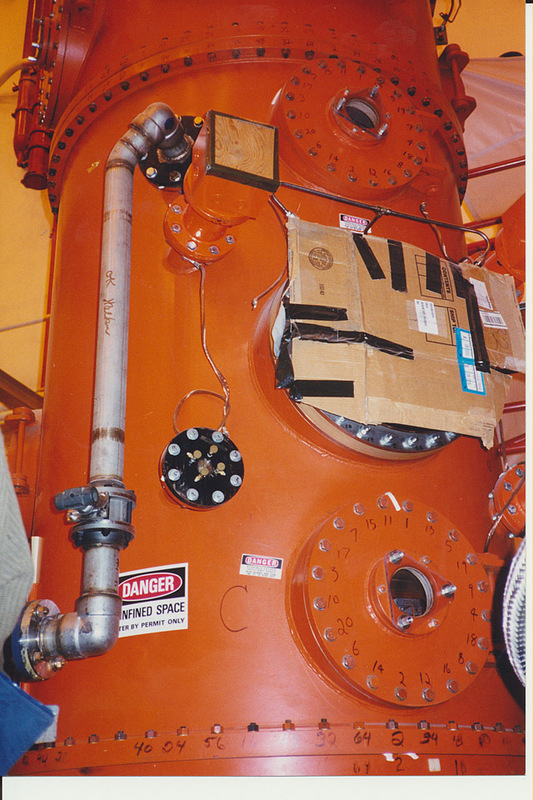 Mounted on the flange is the three isolation valves that will accept the particle accelerators developed by the University of California, Berkeley. 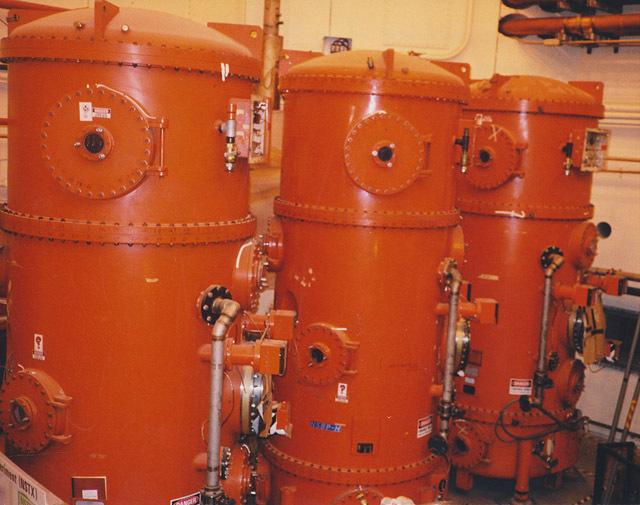 A side view of the isolation valves, 90" flange, and the neutralizer chambers. 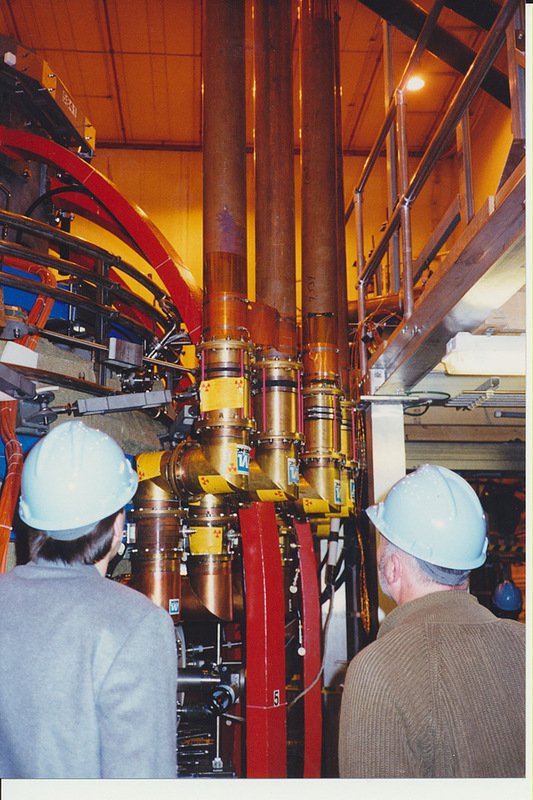 the delicate particle accelerator from the enormous amounts of energy used to operate it. 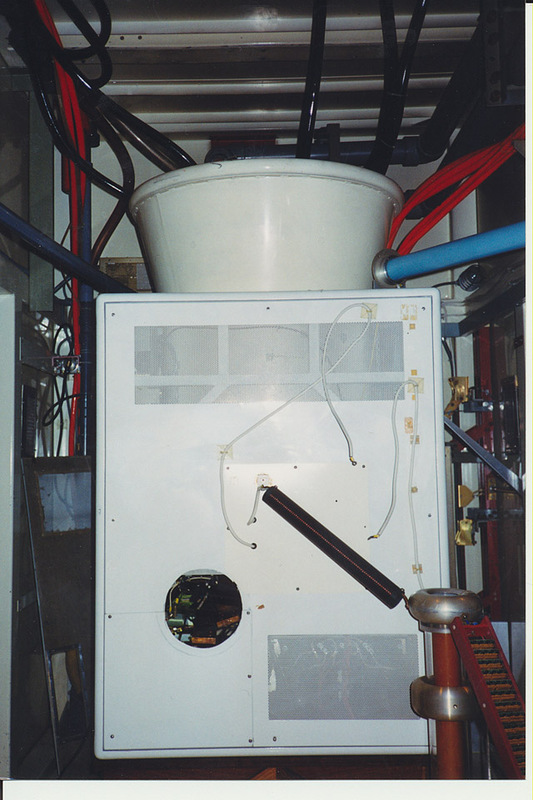 An enclosure housing the power tetrode used to regulate the 120 Kilo-Volts to the accelerator. 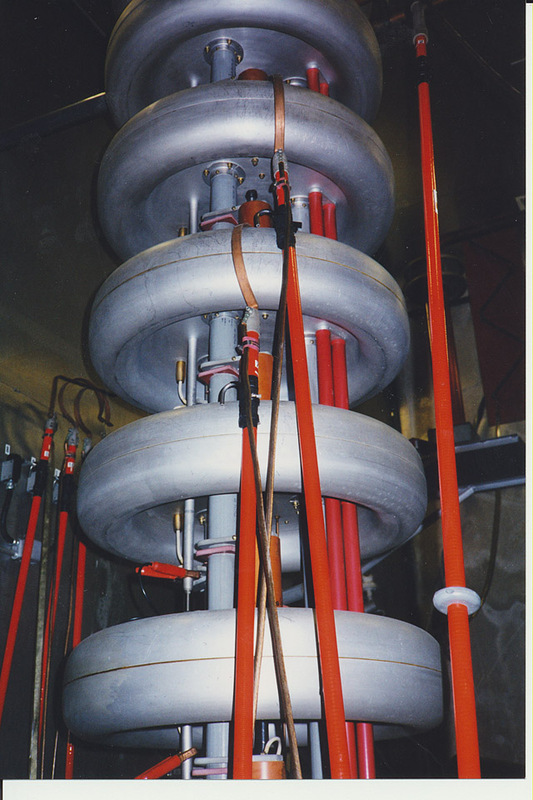 Capable of regulating 0 to 120 kV at 70 Amps in 75 micro-seconds with a +/- .1 accuracy. 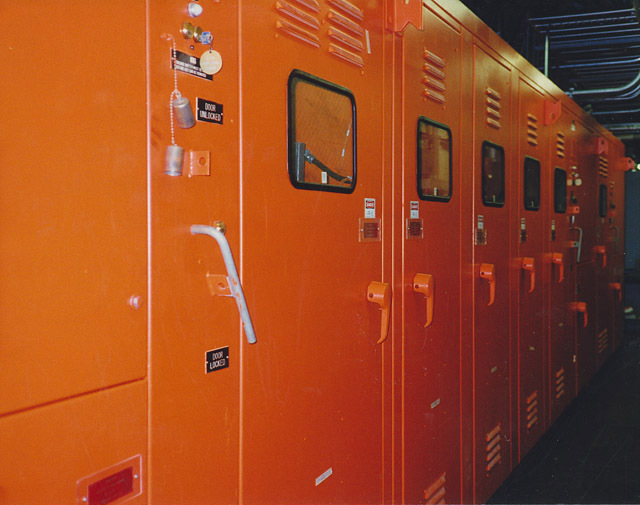 The power supplies for the NSTX magnet sets. Designed around 39 identical solid state power supplies each capable of delivering 20,000 Amps at 2,000 Volts. Only about 25 of this capability is currently used to operate NSTX. The safety disconnect ground switches which are pneumatically operated to disconnect the NSTX device from its power sources and to electrically ground all experimental areas in the case of a fault or the loss of a door interlock. Me standing on the deck in front of the NSTX machine itself. 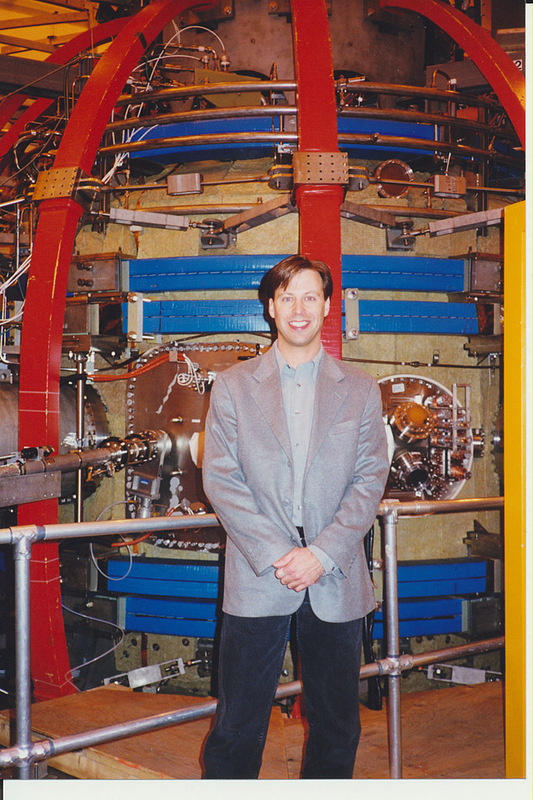 The red and blue arcs are part of the magnetic containment coils. 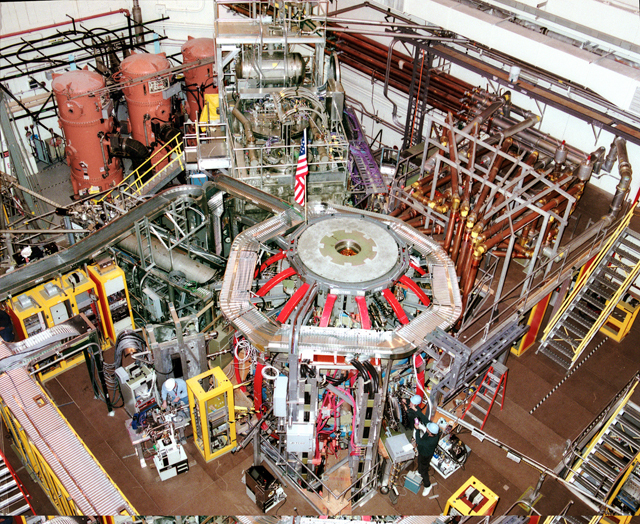 Top view of the entire Experimental Area. Note the workers for scale.